December 12, 2018. 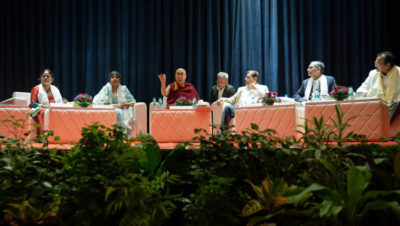 Mumbai, India – There was warm sunshine and the skies overhead were blue as His Holiness the Dalai Lama drove to the University of Mumbai today. He had been invited to inaugurate an international conference on the concept of ‘maitri’ or ‘metta’, commonly translated as loving-kindness or friendliness. He was met on arrival at the Vidyanagari Campus, Kalina, by the Vice-Chancellor Prof Subhas Pednekar, Maharashtra Government Minister Rajkumarji Badole and Head of the Department of Philosophy, Dr Geeta Ramana. They accompanied His Holiness to the Green Technology Auditorium, where he was invited to join the audience of almost 300, students and faculty, taking a seat in the front row. Dr Archana Malik-Goure welcomed the guests and everyone present. For the first few minutes, five students, one of whom was blind, presented a rigorous performance of yoga asanas while keeping a lighted candle steady on top of their heads. At the same time a series of questions and reflections on the concept of ‘maitri’ was projected onto a screen above them. Children presented nosegays to His Holiness and other guests. Introducing the occasion, Dr Geeta Ramana declared that the University and the Dept of Philosophy in particular was blessed by His Holiness’s presence. She explained that a three day conference beginning today would consider the familiar concept of loving-kindness and friendliness from a philosophical standpoint. She invited the Vice-Chancellor to present His Holiness with a shawl, after which a large number of members of faculty processed onto the stage to offer their own greetings. The first guest of honour, Shri Rajkumarji Badole, who is himself a Buddhist, opened his remarks by reciting lines for taking refuge in Pali. He spoke first in Marathi and then in English stating that ‘maitri’ is a state of mind that fosters a happy family and happy community. He expressed himself privileged to share a platform with His Holiness. Vice-Chancellor Prof Subhas Pednekar told the gathering how much he appreciated the initiative of the Department of Philosophy in convening this conference to explore and discuss ‘maitri’. He professed it an honour to listen to His Holiness, someone whose work for peace and harmony in the world is so well-known. He stated that, having been founded in 1857, the University of Mumbai is one of the earliest state universities in India. With more than 500,000 students and more than 700 affiliated colleges it is also one of the largest. It is the only university to have produced five recipients of the Bharat Ratna, India’s highest civilian award. He concluded by requesting His Holiness to release the second issue of the first volume of the Dept of Philosophy’s journal and to give the inaugural address. “Respected sisters and brothers,” His Holiness began, “in today’s world, we need to make a special effort to promote loving-kindness. Women have a special role in this since they are generally more sensitive to others’ pain. In my own case, it was my mother who first taught me about kindness. She sowed the seed in my mind. It is our mother who gives most of us a living example of kindness right at the start of our lives. “On the other hand, the warriors of the past were almost entirely men. They are celebrated as heroes and yet they were killers. Isn’t it the case that most butchers too are men? Therefore, it’s reasonable to salute our sisters first. “I very much appreciate your convening this conference; we need this kind of discussion. In some ways loving-kindness is something we take for granted, yet it is something we need to make an effort to develop. Our level of education is highly developed, but look at the world around us. We’re at peace here, but elsewhere, at this very moment, people are being killed and innocent children are starving. Look at what’s happening in Syria and Yemen. We make too much of differences of nationality, faith, or race and neglect others’ suffering because they are ‘not like us’. “In the 20th century, so much suffering took place due to violence and war, and yet we still tend to think that we can solve problems by resort to the use of force. This is not a healthy sign, but most of the people on this planet are fed up with violence. Look at how many demonstrated against the impending war in Iraq. Another example is the creation of the European Union by nations that had fought throughout history. After the horrors of the first and second world wars they concluded it was more important to protect the common interest rather than assert national sovereignty. The global economy is contained by no national boundaries. The threat of climate change is not limited by national boundaries either—it affects us all. These features of our lives require that we work together. His Holiness explained that modern education is oriented towards material goals, but it also needs to focus on inner values. Alongside physical hygiene, we need emotional hygiene, learning to tackle our destructive emotions. Mothers gave birth to all 7 billion human beings alive today. They survived as a result of care and affection. As young children they did not care about nationality, faith or caste, but learned to distinguish such differences resulting in a sense of ‘us’ and ‘them’. This is how we create problems for ourselves, despite the fact that at a deeper level we are all the same in being human. 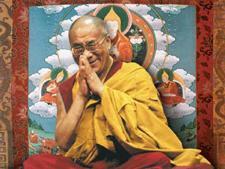 ‘Maitri’ and ‘karuna’, friendliness and compassion are essential in day to day life. We find them described in religious texts, but we can observe and develop them in an objective, secular way.